Aidan O'Brien's Pedro The Great was a surprise winner of the feature event at the Curragh, the Keeneland Phoenix Stakes on August 12. Cristoforo Colombo, a stablemate of the winner, was travelling with great ease about a furlong out when he appeared to clip heels with Probably and gave Joseph O'Brien a crashing fall. The pair were able to walk away, though Cristoforo Colombo was reported to have a cut to a leg. Bungle Inthejungle put the pace to the race but was a spent force just after halfway and Leitir Mor and Probably were left in front, but Seamie Heffernan brought Pedro The Great (10-1) to challenge widest of all to win going away by two and three-quarter lengths. Leitir Mor was second. Paddy Power gave the winner a 33-1 quote for the 2000 Guineas. Heffernan said: "I blamed myself a bit the last day, I probably made too much use of him. "At the time we thought it could have been the heavy ground as we thought the Henrythenavigators wanted fast ground, but we are still learning about them. "I pulled him out with a furlong and a half to go and once he was in the clear I was always going to win. He was still going strong at the line, so seven furlongs or even a mile would be no problem to him." 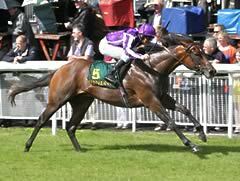 O'Brien added: "He won his maiden very impressively. He was a bit fresh the last day and we decided to take our time with him today and he settled well. "He won't mind stepping up to seven furlongs and it's quite possible he will come back here for the National Stakes." To compound a miserable day for Johnny Murtagh after defeats on Born To Sea and Harasiya, he was dislodged from Lottie Dod on the way to the start and was stood down for the rest of the day. Pat Smullen took the mount instead and finished third.